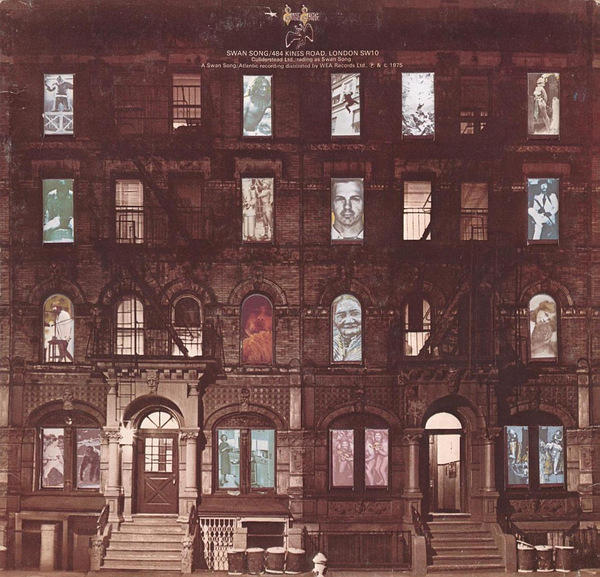 The cover to Led Zeppelin’s “Physical Graffiti” album is a photograph of a New York City tenement block located at 96 and 98 St. Mark’s Place New York City, New York in the East Village. 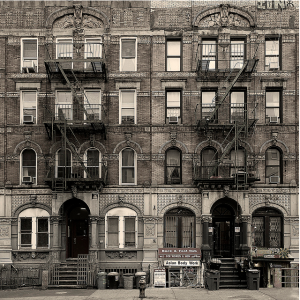 The album’s cover designer, Peter Corriston was looking for a building that was symmetrical with interesting details, that was not obstructed by other objects and would fit the square album cover. 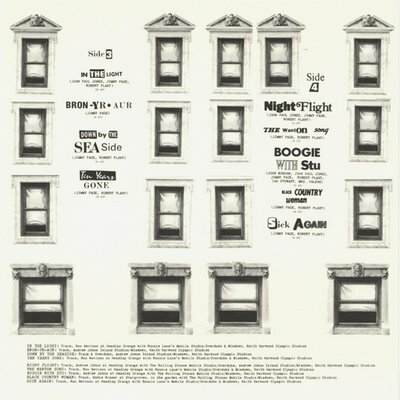 To enable the image to fit properly with the square format of the album cover, the fourth floor (of five) had to be cropped out, making them appear as four-story buildings in the image. Here is a photo of the building now with all 5 floors. The front cover is a daytime image, while the back cover is the same image but at nighttime. Here is the back cover. 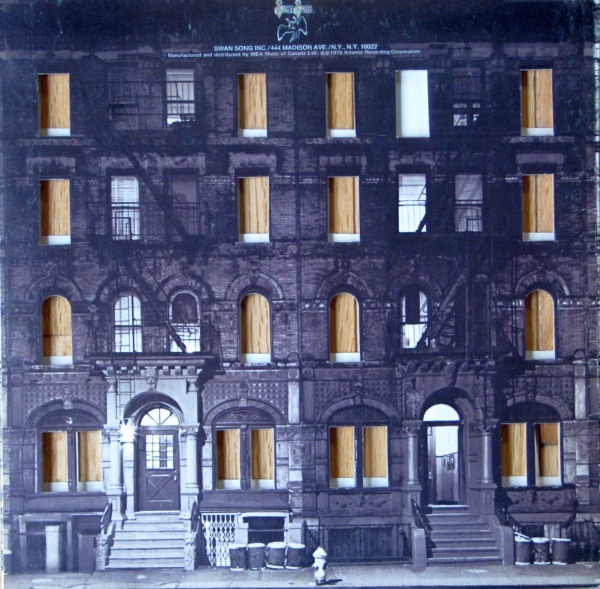 The original album featured the building with the windows cut out on the cover and various sleeves that could be placed under the cover, filling the windows with the album title, track information or liner notes. with interchanging window illustrations. A feelnumb.com reader Simon sent us a link to an amazing presentation he made on flickr that shows all the changes made to the building on the album cover including these facts…The buildings to the left and right were changed to match the style of the double front. Tiles were added on the roof section along with more faces. 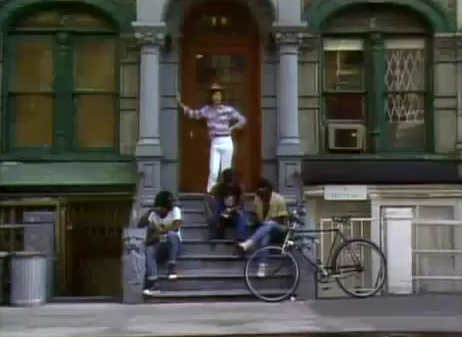 Part of the top right railing balcony was left out for a whole window frame to be visible. Below you will find the google street view link so you can check out yourself…. 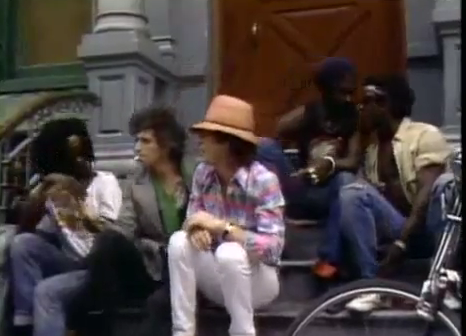 On another note, the buildings are also the same buildings Keith Richards and Mick Jagger were filmed in front of in the Rolling Stones music video “Waiting on a Friend“. 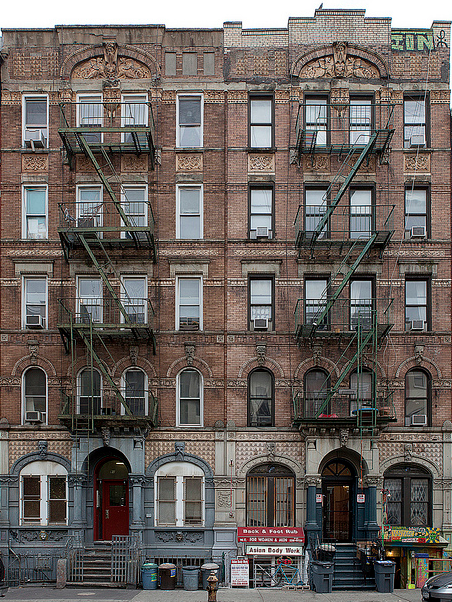 Whilst in New York this year it was a must that I find the tenement block that featured on my favorite and Led Zeppelin’s biggest album Physical Graffiti. When I got back home I set about changing my photographic view to match the cover artwork. It is widely known that the building is 5 stories high, but on the cover the building has only 4 stories. When I started to compare my photograph and the album artwork I soon realised that as well as the 4th floor being removed, artist Peter Corriston also added a number of further elements that include extra tiles, faces and sides of the building and missed out part of the railings in the top right balcony. 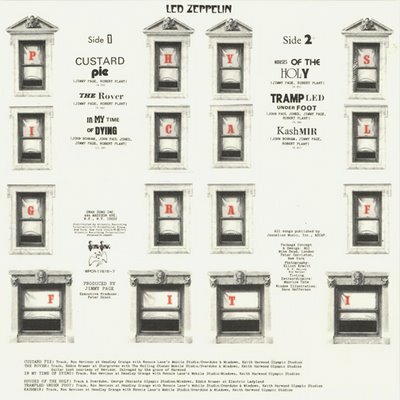 Artist Peter Corriston worked with designer Mike Doud to convince Led Zeppelin manager, Peter Grant, that the cover art idea was a good one. Unlikely as it may seem, the concept was itself heavily influenced by the design for Jose Feliciano’s album, Compartments (1973). 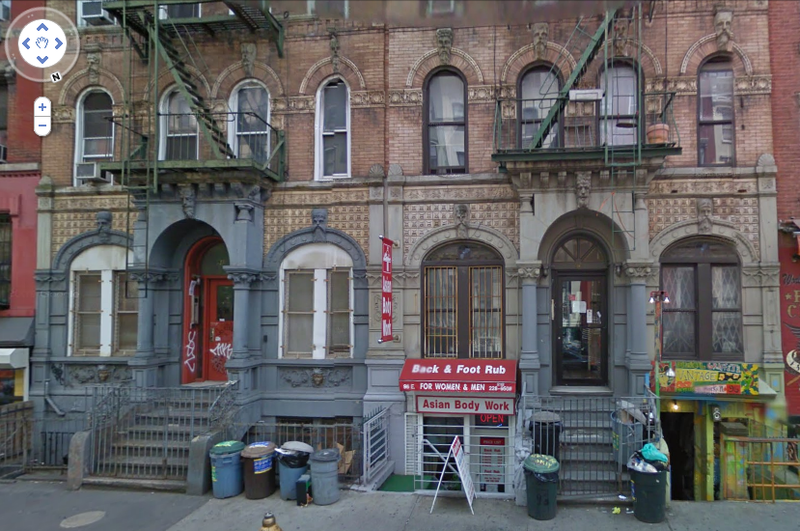 The new version was created by using a photograph of a New York apartment block, situated at 97 St. Marks Place. The building is still standing today. In the basement is a second-hand clothes shop. 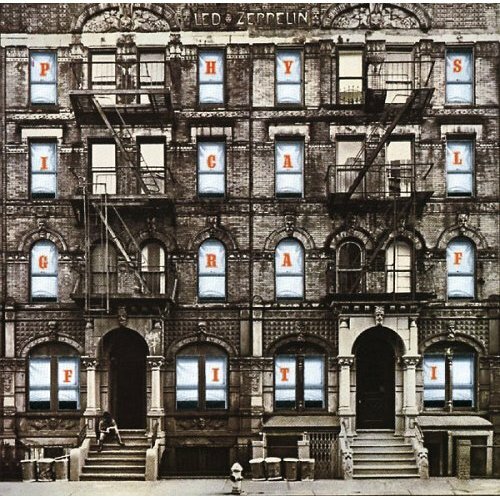 The name of the shop is, naturally, Physical Graffiti. Goto my flickr website to see my final version with notes about these additions. i'd love to add with your permission, your pictures and photo's to this story.